Yoshitomo Tsutsugo and Sho Nakata, NPB’s middle o the order guys, are asked about what they eat to stay big and strong. Certainly, no prize money or trophy goes to the winners at Nagoya Dome and Kyocera Dome Osaka. But for the Japanese, they represent the countdown to the next World Baseball Classic, something that is really, really important here. In 2013, when Samurai Japan failed to win the WBC after two straight championships, alarm bells rang. 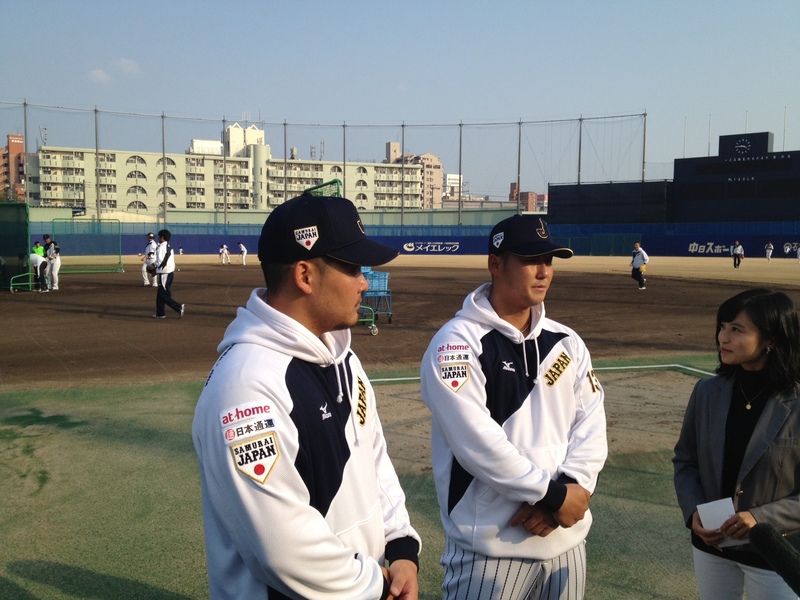 Through 2012, NPB had made last-minute managing selections. Its first two managers were taken from NPB’s active managing ranks, but with no active skippers willing to step in in 2013, it went for a retiree. Koji Yamamoto hadn’t managed in years and hadn’t done that well when he did. Probably figuring that if NPB couldn’t be bothered to actually find a real manager, none of Japan’s big leaguers who were asked to join came (Junichi Tazawa wasn’t asked) . In the wake of Japan losing to Puerto Rico in the WBC semifinals, NPB opted for a regular manager and turned to Hiroki Kokubo, a well-respected veteran who had just retired but who had never managed. With the union unhappy that only a fraction of the money from Japan-based sponsors who spend heavily in the WBC reached NPB and its union, NPB Enterprises was founded. The company manages the business of the “national team” and captures sponsorship income for the 47 months between WBC. With a manager and a structure for seeking sponsorship money, NPB is more committed to the WBC than anyone but the tournament’s organizing body World Baseball Classic Inc. While the results of the Taiwan games are not meaningful, it is a crucial time for Kokubo, his players and coaches. It certainly helped Yomiuri Giants pitcher Tomoyuki Sugano, who was coming off a mediocre effort in last autumn’s Premier 12, but was razor sharp in Saturday’s opener.